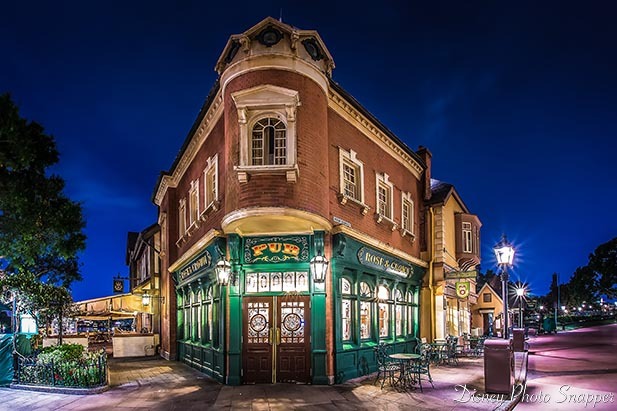 Located along the World Showcase Lagoon, the Epcot United Kingdom Pavilion is full of authentic merchandise, food, and music. Take this fun quiz and test your knowledge of Epcot’s United Kingdom Pavilion! On October 1, 1982, Walt Disney World’s Epcot Center opened with five Future World pavilions and nine World Showcase Pavilions — Mexico, China, Germany, Italy, American Adventure, Japan, France, United Kingdom, Canada. Located along the World Showcase Lagoon, the Epcot United Kingdom Pavilion is full of authentic merchandise, food, and music. Take this fun quiz and test your knowledge of Epcot’s United Kingdom Pavilion! The United Kingdom Pavilion, at Epcot is located between Canada and what other pavilion? What is the name of the shop in the United Kingdom Pavilion that sells specialty tea items, candies & chocolates usually only available in the UK? What is the name of the sit down table service restaurant in the United Kingdom Pavilion? What is the name of the walk up quick service restaurant in the United Kingdom Pavilion? Which Walt Disney character would you NOT find having a meet and greet in the United Kingdom Pavilion? Which is a popular alcoholic beverage in the United Kingdom Pavilion? What specialty store would you enter if you were looking for Paddington Bear merchandise in the Epcot United Kingdom Pavilion? What is a popular photo spot in the United Kingdom Pavilion? What is the name of the band that plays classic British Rock such as the Beatles, the Rolling Stones, Queen & the Who in the United Kingdom Pavilion? Quiz: Test Your Knowledge of the Current 2019 Walt Disney World Attractions as described on the Official Walt Disney World Website! Quiz: Disney’s Animal Kingdom – How Well Do You Know The Wild Theme Park? I missed the Tea shop question. You’d figure I would get that one after my wife has dragged me into that shop on every single trip since we got married, but nope! You should have known that one! I’m telling your wife !!! That…was hard! Great quiz, for sure! Awesome! I’m glad you enjoyed it!! and not a single Doctor Who question! Sorry… I just waltz right past all of the Doctor Who merch and wasn’t even thinking about it! Booooooooooooooooo…. sorry girl!! But you had an awesome score!!! Yeah, I don’t think I spend enough time in the UK..
Next time… its a must do!! I shouldn’t say this, but one of the easiest quizzes for me to date! I must really know the United Kingdom Pavilion!